Learn how to create an old-fashioned, vintage photo effect with Adobe Lightroom. Once you know the steps, you can easily create the same effect using Camera Raw in Photoshop! For Lightroom CC. In this Adobe Lightroom tutorial, we'll learn how to easily turn a new photo into an old-fashioned, vintage photo. 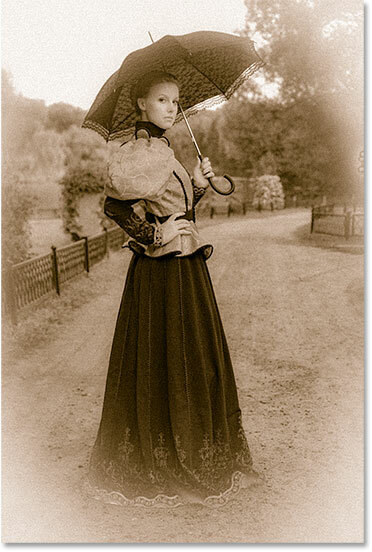 In a previous tutorial, we learned how to create the same vintage photo effect using the Camera Raw filter in Photoshop. 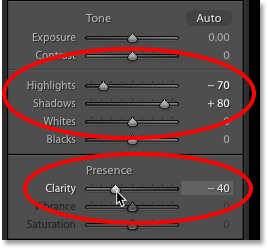 Since Camera Raw and Lightroom share the same panels with the same options, the steps for creating this effect in Lightroom are exactly the same. In fact, with Lightroom, it's even easier, since we can select the image we want to use and apply the vintage photo effect all from within Lightroom itself. Let's see how it works. 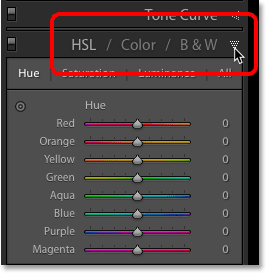 We'll start by creating a custom black and white version of our image using Lightroom's HSL / Color / B&W panel. 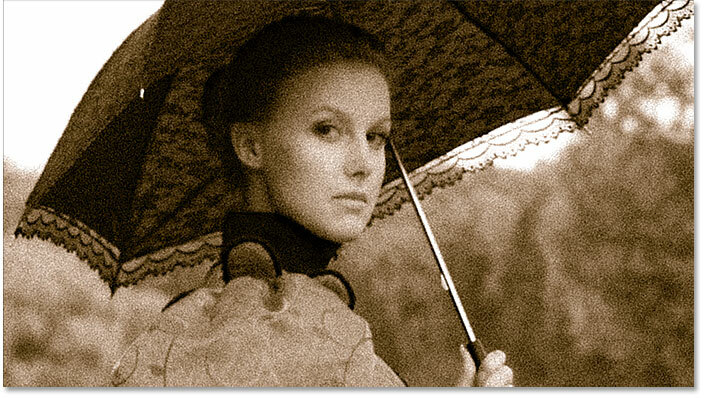 Then, we'll give it more of an old fashioned look by adding a sepia tone using the Split Toning panel. We'll add grain and a vignette effect with the Effects panel. 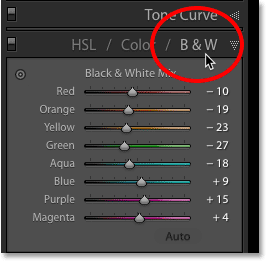 And finally, we'll use the Basic panel to fade the image by toning down the highlights, brightening the shadows and reducing contrast in the midtones. And because everything we do in Lightroom is non-destructive, the original image always remains safe. 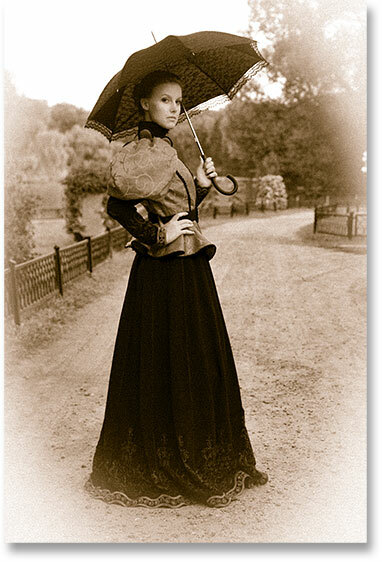 The final vintage photo effect in Adobe Lightroom. 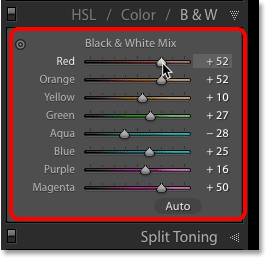 Opening the HSL / Color / B&W panel in Lightroom. Clicking "B&W" in the tab. To create a custom black and white version of your image, drag the individual color sliders (Red, Orange, Yellow, Green, Aqua, Blue, Purple, and Magenta) left or right. 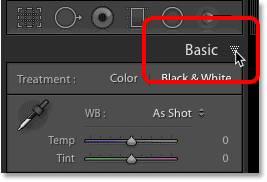 Dragging a slider to the left will darken any areas in the black and white version that originally contained the slider's color. Dragging to the right will lighten those areas. 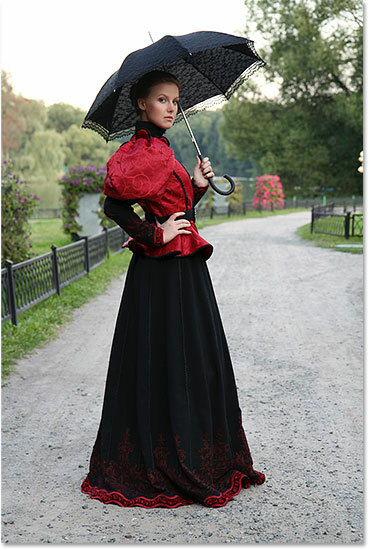 For example, dragging the Red slider to the right will lighten any areas that originally contained red. Dragging the Green slider to the left will darken any areas that contained green, and so on. Dragging the color sliders to create a custom black and white version. The color image now converted to black and white. 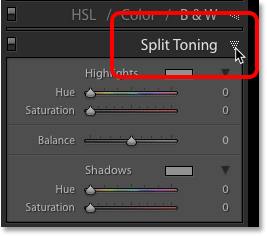 Clicking the arrow to open the Split Toning panel. 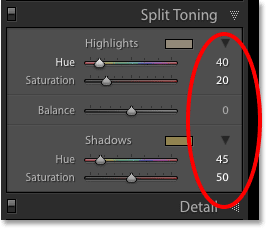 The Split Toning panel is divided into a Highlights section at the top and a Shadows section at the bottom, allowing us to set different colors for the lightest and darkest areas of the image. In the Highlights section, set the Hue to 40 for a nice orange-yellow. You won't actually see the color until you increase the saturation. Set the Saturation value to 20. Setting the Hue and Saturation values for the Highlights and Shadows. The effect after adding the sepia tone. The Effects panel contains three main effects that we can apply to the image. There's Post-Crop Vignetting at the top, Grain in the middle and a new Dehaze effect that was recently added to Lightroom (and which we don't need for our vintage photo effect). We'll start by adding some grain. 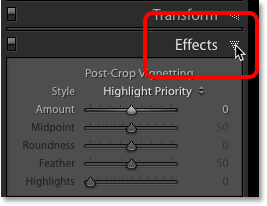 The Grain settings in the Effects panel. The vintage effect after adding grain. Fading the corners by dragging the Amount slider to the right. The effect after adding both the grain and the vignette. We'll use a few sliders in the Basic panel to lower the overall contrast of the image so it looks even more like it has faded over time. 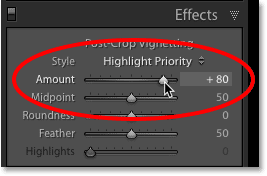 First, to tone down the highlights, drag the Highlights slider towards the left. The further you drag, the more you'll darken the brightest parts of the image. I'll lower my Highlights value all the way down to -70. Then, to brighten the darkest areas, drag the Shadows slider towards the right. I'll increase my Shadows value to +80. The Highlights, Shadows and Clarity sliders in the Basic panel. The final vintage photo effect. And there we have it! That's how to easily turn a new photo into an old fashioned, vintage photo using Adobe Lightroom! To see how the steps we've covered in Lightroom compare with Camera Raw, check out our Vintage Photo Effect With Camera Raw tutorial. Looking for Photoshop effects? Visit our Photo Effects section for easy-to-follow, step-by-step tutorials, or check out our latest video tutorials on our YouTube channel!